Rayman, named platformer of the year and winner of multiple artistic and musical achievements, is back with a brand new adventure. Michel Ancel, celebrated creator of Rayman®, Beyond Good & Evil® and the Raving Rabbids®. Additionally, advancements in the UbiArt engine has helped pave the way for new, more detailed graphics and lighting. Try it now for free by downloading "Rayman Legends Demo" in the Free Games section of the Uplay application. When it comes to gameplay, Rayman Legends offers everything you have come to expect from an installment in the Rayman series. Safety is fleeting, and certain death is never far away. Fast-paced side scrolling gameplay takes you through a host of dangerous environments that pile challenge upon challenge on top of you, inviting fatal mistakes at every turn, and learning to glide through the challenges thrown at you is part of what makes Rayman Legends so satisfying to play. To be successful, you need to learn to run, jump and swim your way through a diverse set of environments, each one more deadly than the last. Hyper-realistic graphics are fun some of the time, but often, a move toward simplicity does wonders to create a sense of immersion. That is emphatically the case in Rayman Legends. Appropriately, its whimsical, hand-drawn 2-D graphics perfectly evoke the feeling of roaming through paintings. Every world from the medieval-themed Teensies in Trouble to the Greek-themed Olympus Maximum is captivating, and each world has its own unique atmosphere, making it a pleasure to work your way through each stage of the game. The character animations themselves are fluid and pleasing to the eye, ensuring that Rayman Legends is always perfectly immersive. Whether you prefer to work cooperatively or competitively, Rayman Legends gives you many opportunities to have fun with your friends. Its cooperative mode offers support for up to four other players, and it integrates seamlessly into the single-player story mode; friends have the ability to join you online or in person at any point in the game, taking command of a character of their choice and aiding you in your journey. If you have a more competitive bent, Rayman Legends features Kung Foot, a multiplayer game that pits you against your friends as you aim to score goals against one another. 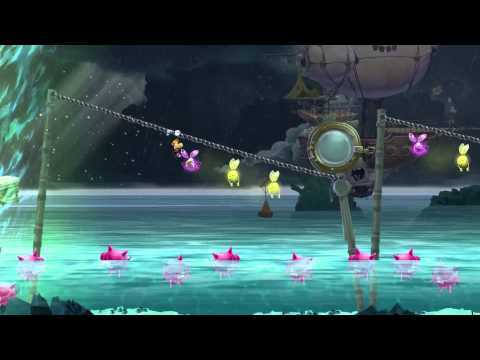 Rayman Legends offers many bonuses beyond its main sidescrolling story mode. Interspersed between its fast-paced, heart-stopping platformer gameplay are a variety rhythm-based levels that challenge your musical aptitude in addition to your platforming abilities. Daily and weekly challenges pit you against other players around the world as you vie to be the best at various in-game feats that range from collecting Lums to surviving as long as possible in a certain stage. Plus, when you finish the main story, play through 40 levels from the original Rayman Origins that have been remastered to match the graphical level of Rayman Legends. ADDITIONAL NOTES:Supported Video/Graphics Cards at Time of Release: AMD Radeon™ X1950 Pro / 2000 / 3000 / 4000 / 5000 / 6000 / 7000 series NVIDIA® GeForce® 6800 GT / 7 / 8 / 9 / 200 / 400 / 500 / 600 / 700 series Laptop versions of these cards may work, but are not officially supported. These chipsets are the only ones that will run this game. For the mOperating Systemt up-to-date minimum requirement listings, please visit the FAQ on our support website at http://support.ubi.com.